I drew the sketch for my first blog (Curtain Call) even before I wrote the text. The content was always in my heart. It just had to be filtered and that took a bit of time. It was how I felt and I drew it in a few minutes. Karina, my son’s life partner, filled in the colors and the picture came to life. But my husband did not like my sketch. He said that it was not good enough. So, he spent all of Monday night making it better. The curtains were transformed into thick, red velvet drapes worthy of a grand concert hall and the girl with the slanted eyes became the darker cousin of Belle (of Beauty and the Beast fame). It broke my heart to say I did not like it at all. It’s not me, I kept telling him. Reluctantly, many variations of the sketch further, and close to midnight, he gave in. All right then, if that’s what you really want. I knew (and will always know) that what he does is out of love. It is his need to protect me, sometimes even from my self. I am not perfect. Have never aspired to be. If I were to equate myself with food, I would be a stew not a 3-layered pure chocolate chiffon cake lined with fresh cream and strawberries frosted with white chocolate and topped with even more strawberries. Good enough is good enough for me. It means that there is room for improvement. Perfect is scary. 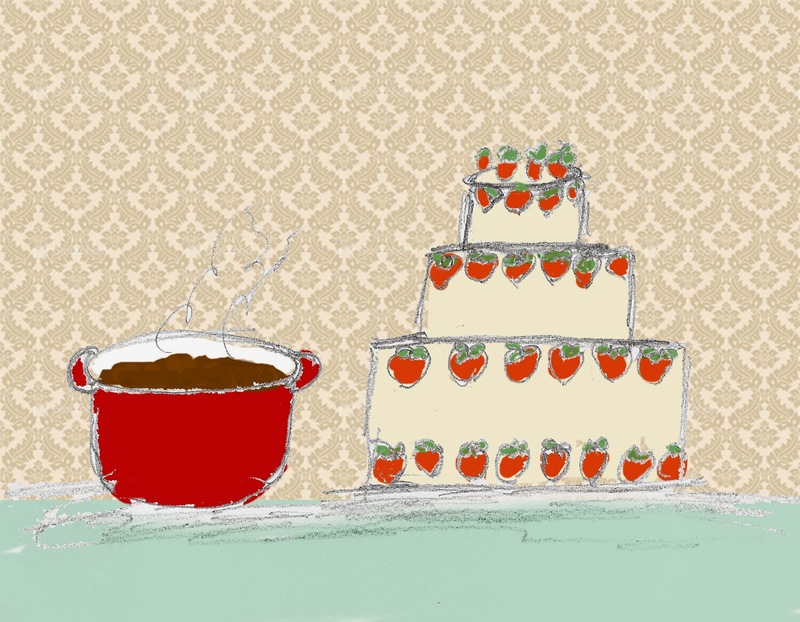 If I add another strawberry on the frosting will the cake topple over? As for the stew, it can be pork, beef, chicken, fish or a combination of any of the above. I am sure there are vegetarian versions as well. Plus you can add most anything you have in the cupboard into it. Throw in the frozen peas, mushroom, beans, even some apricots. It never tastes quite the same and never looks like the one you made before. But, when you get down to eating it ... it tastes like .... home. Yours. It is no longer some famous chef’s creation or some lady blogging in her kitchen about her grandmother’s all-time, foolproof concoction. It is a one-of-a-kind and personal. Most of my friends are stews. Perhaps, I feel threatened by beautiful people. The ones to whom success seems to have been given as a birthright. It is so much more comfortable to be in the company of those who quietly go about life, taking the punches and celebrating special moments. Friends who make me feel like I'm sitting in front of a warm hearth on a cold day, not out in the arena about to face the lions. As I leaf through the pages of the glossy magazine at the hairdresser’s waiting room, I must admit a certain amount of awe and a tinge of jealousy at the lives of the rich and famous. Oh, to be able to casually walk around in my Armani summer dress, to be able to lie down and sleep all the way to Manila in First Class (Business will do as well!) and not with my face scrounged against the airplane window, to have a swimming pool in the cellar… oh, to be a 3-tiered chocolate cake with fresh strawberries over the white chocolate frosting. I do have a saving grace. I am lactose intolerant. I was never meant to eat such a rich cake. Nor be one. I am the lady that makes the stew. And that is good enough. Here’s one of many stew recipes. This is the stew we had for dinner last Saturday. I added black olives and slices of rookworst (smoked Dutch sausage) at the last minute because I was afraid it was not enough. I am still eating the leftovers!! Heat the olive oil in a large, thick-bottomed pot. Add the bacon and cook over medium heat for 10 minutes, stirring occasionally, until the bacon is lightly browned. Remove the bacon with a slotted spoon to a large plate. Toss the carrots, and onions, salt and pepper in the remaining fat. Stir occasionally and cook until the onions are lightly browned. Add the garlic and cook for another minute. Add the Cognac. Stand back, and ignite with a match to burn off the alcohol. Put the meat and bacon back into the pot with the juices. Add the wine plus enough broth or water to almost cover the meat. Add the tomato paste and spices. Boil and then simmer gently for about 2-3 hours or until the beef is tender. Add the mushrooms and allow to boil again. Meanwhile, combine the butter and the flour with a fork. Stir the mixture into the stew and mix gently until the gravy turns creamy. Simmer again for a few more minutes to allow the flavors to meld into each other. Season with more salt and pepper or an extra bouillon cube if needed. Serve with rice, noodles, roast or mash potatoes or crusty bread. A fresh, mixed green salad or a dish of sautéed broccoli or green beans completes the meal. And don’t forget to serve the rest of the red wine with it!! Love your words and drawing and do look forward to cooking your stew. You make me smile as I "hear" you saying your words while we sit and chat and laugh and relax together. Carla... to me you are flowers. Keep blooming and brighten up our world. Carla, I do miss our kitchen table chats! So many friends have come and gone, I think that is why I have resorted to blogging. There is this need to share. Thank you for sitting with me, even across the miles.